Just print and play with these rare Victorian paper dolls. What did young children play with during the Civil War era? Paper dolls have been an affordable toy for children for almost two centuries. In 1859, Godey’s Lady’s Book was the first magazine to publish pages of paper dolls in their monthly issue; included was a page of six figures for “the little girls who read Godey” to color, plus a page of hand colored costumes to cut out. A long lost treasure! Find beautiful color images – as sharp and clear as when originally published – of these rare paper dolls. 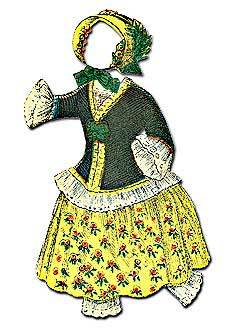 You can download these rare paper dolls from the November 1859 issue of Godey’s Lady’s Book. This fun filled ebook features digital reproductions of original Victorian paper dolls to color, cut-out and play. These pages are impossible to find today because they were removed long ago from most of the original magazines by young Victorian girls anxious to play. Each of these rare century old images was scanned at a high resolution and digitally restored for color and clarity. In addition, we have enlarged each image separately for younger children to handle more easily. Print the paper dolls on cardstock paper and wrap in a bow for a charming holiday gift for that special child. You can make whimsical Christmas ornaments, just print … color … add ribbons … hang on the tree! Teachers … print as many pages as you need for an entertaining history lesson! Re-enactors … entertain the children with an authentic toy – print as many as you need. These Victorian Paper dolls are free for all Victoriana Magazine Facebook fans – just click ‘Free for Fans’ for all our free eBooks and downloads. Explore photos, games and videos about the Victorian era. Vintage sleds with brightly colored tops and swan neck ornaments. Game that both amuses and immerses you in the city’s rich past. Victorian children were seen and not heard ... not quite. Macy’s holiday tradition is based on the “Yes, Virginia, there is a Santa Claus” editorial from 1897.